In this line of work (interviewing artists), it’s always a personal thrill and honor for me to be able to hear icons share their thoughts and stories with me and to the Boomerocity readers. The icing on the cake is when an icon agrees to a second interview with Boomerocity. It’s happened a few times in Boomerocity’s 3+ year history and it’s recently happened yet again with rock and blues great, Johnny Winter. My first interview with the veteran of Woodstock (here) took place almost two years ago prior to an appearance he was about to make in Dallas. Low and behold, the second interview took place under the same circumstances. I learned from my last interview with Winter - as well as from the research I conducted for both interviews - that he is a man of few words. However, like a well written song that has just the right amount of notes, Johnny’s words convey his thoughts crisply and succinctly. Nothing more. Nothing less. The man is not one to hide anything. As he’s said in interviews with me as well as with many other people, pretty much everything there is to know about him is out there – especially in his authorized biography, Raisin’ Cain. You may wince and what all has happened in his life and the demons that he’s battled but it is what it is. Take it or leave it. The rock and roll rollercoaster that was, and is, Johnny Winter’s life is well known and documented. Many people counted the prodigious guitarist down for the count many times over the years. While they certainly couldn’t be faulted for doing so, Winter has proved them all wrong and is enjoying quite a resurgence in his popularity thanks in large part to the caring, guiding hand of Paul Nelson. Nelson not only serves as Johnny’s manager but is also his wing man (2nd guitarist) on stage. Nelson stepped into a very toxic environment that, if it hadn’t changed, would have surely resulted in the premature death of Winter. 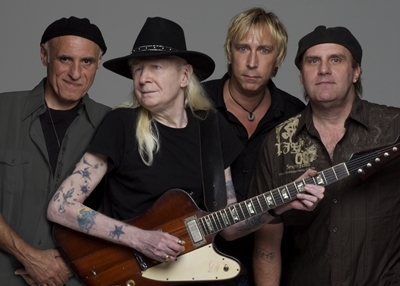 It was a long, gradual, methodical process but with genuine concern, patience and sound business and marketing practices, Johnny Winter’s career has taken a turn for the best and reaching a whole new group of fans. I caught up by phone with Johnny and Paul as they were on their tour bus in route to a gig in Massachusetts. And what is the reaction to the tunes from the fans? “Real, real good. They’re likin’ Dust My Broom and Got My Mojo Workin’”. According to my research, “Roots” is Johnny’s 18th studio solo album since 1968. He has observed a lot of changes in recording technology and process since that album, The Progressive Blues Experiment. While those changes are obvious, I was curious as to what is the same for him in recording blues today as compared to that first album. In one of the Winter interviews I had read, he was asked, when practicing, what scales he liked to play. He said something to the effect that he just copied the sounds of other artists and played by ear. I turned the scenario around on him and asked if he was aware of anyone who was copying his licks. As discussed in the Boomerocity review of Roots upon its release (here), there are a boat load of highly talented guest artists lending a hand. Great folks like Johnny’s brother, Edgar, Derek Trucks and his lovely wife, Susan Tedeschi, John Popper from Blues Traveller, country guitar slinger, Vince Gill, organist, John Medeski, and guitarists Sonny Landreth and Jimmy Vivino all lend incredible sounds to this project. I expected that Roots to have taken a long time to put together with all of the talent that was on the album. However, I was stunned at the answer I received from Johnny when I asked him about it. Five hours. I mean, seriously? Five hours? Unreal. As for what Winter’s fans can expect from the band during this year’s touring, Johnny replied, “I’ll do mostly blues and a little rock and roll.” Nelson added, “What happened was, after the Roots idea, and after Johnny picked the songs, I had to make sure that the band - the rhythm section - had learned all of the original versions of the songs that Johnny listened to when he grew up. Then, I had them learn a secondary version – a second version of each of those songs. What happened was that the group as a whole improved. We got more ‘simpler’. We got more pure into that traditional sound but then modernized the sound on Roots. We knew that we had to be a tight rhythm section for Johnny and the heavy hitters we would be playing for on the album. “It improved our live show and the music is more driving. It’s more solid. The song selection is tighter now. Johnny has added Bony Moronie, Johnny B. Goode. He’s added School Girl – you know, some of the more rock’ish kind of songs mixed in with the blues. Highway 61. The show is actually now – finally – now that Johnny’s healthy, he’s starting to experiment more and improve and add more of the old catalog and new stuff. So, it’s a lot different. A lot more energy. When I told Johnny and Paul that the upcoming show at the Granada has been sold out, Paul was bubbling over with excitement and added, “He’s selling out everywhere. People are starting to realize – especially now that he’s healthy – that they don’t want to miss out on Johnny. He’s that hidden gem that deserves the credit that might have passed him by and went more towards a Hendrix or a Clapton. He’s our living Hendrix! I’m serious! As he handed the phone off to Paul, I told him that I was looking forward to a good show at his upcoming Dallas appearance. He said, point blank, “You’ll get one.” As they say in his home state of Texas, if it’s true, it ain’t braggin’. With the great vibe Johnny’s enjoying with his resurgence, I asked a question that I know has been asked and answered a million times but I wanted the latest answer: Will Johnny be doing anything with his brother, Edgar, and even with Rick Derringer? Let’s just say that what I was told made me pogo-stick happy and you’ll feel the same way, too, when the news hits the streets. Keep your eye on Boomerocity for that news to break. Until then, you can check out JohnnyWinter.net to see when and where he’s going to be performing near you. You’ll see that he’s keeping a tour schedule that would wear out an artist that is less than half his age so there’s a great chance he’s stopping at a venue in your town.